ROARING FORTIES™ range of Type I Aviation Life Rafts are manufactured from TSO C70a approved lightweight Neoprene fabric. 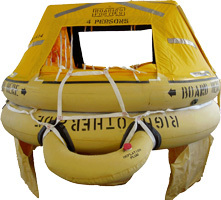 ROARING FORTIES™ range of aviation Life Rafts is from size 4 persons to 11 persons. They are all approved by to TSO C70a by CASA. They are essentially have twin buoyancy tubes with a self erecting canopy. The canopy tube can be deflated separately for evacuation & rescue purposes. Their respective canopies have the ability to withstand 52 knots of gusty wind and with a good sea anchor attached, the rafts will not drip drift significantly away from the point of deployment. The canopy is self erecting. ----- For 11persons, the overload capacity is 16 persons. Aviation life rafts come complete with bailer, bellows, drogue, repair-kit and rescue line. Survival Kits to Parts 91, 121 & 135 are available for packing to rafts.